Li Hechun is a modern priest of the Longmen (Dragon Gate) branch of the Ch'uan-chen (Complete Perfection) School of Taoism in China. This school emphasizes the practice of neidan, or inner alchemy, in the interest of cultivating the spirit. Master Li was born in June 1978, in Shangluo of Shaanxi. He was brought up in a traditional cultural and Taoist atmosphere and developed a strong passion for Taoist studies and martial art. He took his refuge at Chingyang Gong temple in Chengdu, China, studying with Taoist Chen Benshan. Chen is a great hermit and fifteenth generation disciple of Dragon Gate. He instilled Li with the Taoist name "Hechun". Master Li has participated in a number of international conferences on Taoist Studies and had numerous papers published in Taoist and Traditional Chinese Magazines. Arts studied include meditation, playing Taoist music on the ancient "guqing" stringed instrument, painting calligraphy, teaching Tai-chi and Push-hands, chanting ancient scriptures, and performing rituals. Recently, Li Hechun completed his Master's degree thesis on the significance of the Taoist spirit in modern society. 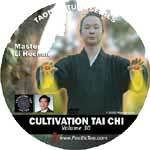 He Loves teaching cultivation practices, and sharing the riches of Taoist culture with all.